Formed a mere two years ago, Italy's Secret Rule has been busy with two albums in two years, the latest Machination on the Scarlet Records label. Now, Secret Rule, not only from Italy, but also fronted by a female vocalist. What's that you say? Another symphonic heavy or power metal band? That's what my expectations were. But that's not entirely so. It's not that aren't some symphonic notes, but they're minimal. More so, Secret Rule is a melodic heavy metal band equally infused with the groove of hard rock and speed of power metal. Or is it the reverse? You catch that amalgamation clearly within Dolls or I Will, the latter has some of that power metal quickness. Even better for that fast pace is You're The Player, once more over a prominent groove and some groovy riffs and hooked with a nice chorus. And you'll pick up the symphonic layer in the middle. Something more should be side about the keyboards. With The Image, they come with the gentleness of the piano, basically supporting the melody of an otherwise vocal anthem. But then Henrik Klingenberg (Sonata Arctica) can get just plain weird with his synthesizers as within Your Trap. At the beginning, and after the midpoint, they sound like some warped interpretation of The Captain and Tenille's Muskrat Love. Strange. Moving on to the vocals, Angela Di Vincenzo has a powerful voice. The expectation that she might be one of the gazillion octave shrill operatic singers can be dismissed. She has some range, but she presents more as a pure hard rock and heavy metal vocalist. It should be noted that within Foolish Daisy, Secret Rule has some moron doing death vocals (and possibly within Dolls also, but muted if there). Whatever. I'll never understand. You write ten or so songs, and then somebody in the band says, "Hey! We gotta be modern and cool. We need a song with dirty vocals. Get over it already. Otherwise, Secret Rule's Machination is a strong second effort, with entertaining melodic hard rock infused heavy metal with a few more twists besides. 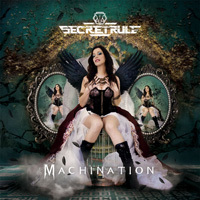 Secret Rule's Machination is a strong second effort, with entertaining melodic hard rock infused heavy metal with a few more twists besides.